Crop covers are “wunder-plants” that reduce erosion and revitalize the soil to help with subsequent plant growth. I can’t wait to see how my crop cover will help with my yields this summer. Note, if you are growing oats to eventually make oatmeal or oat flour, I would recommend hulless oats. Johnny’s Selected Seeds carry organic hulless oat seeds. Why a Crop Cover? Say Good-by to the Runny Nose. Normally, I use straw to suppress the weeds and reduce my water usage. However, I think I am allergic to the straw. Perhaps it is the mold or fungi that helps the straw decompose? Who knows. The outcome is an unsightly and annoying runny nose while I am gardening. And did I forget to mention, the insane amount of sneezing? Do you have the same problem with straw? Searching for an alternative to straw has been a mission for me. When I read about crop covers, I felt I had found my answer. As the oats grew, I didn’t seem to suffer from the runny nose aliment. My goal was to use the dead oats as my “straw” for weed suppression. Each year, I purchased several bales of straw in the Fall to protect the beds from eroding. In the Spring, I purchase more for weed suppression. Once the oats die, they look like the above picture. When it is time to plant, I will simply, separate the oats where I want to plant the seed or seedling. Many people simply till the dead oats into the soil. The rule of thumb is you need to plant oats at least 6 weeks before your Fall’s killing frost. In New Jersey, the killing frost date is usually around October 15. In the South, you can grow oats or barley in the winter. However, the crop cover will have to be turned under to kill it according to a Mother Earth News article. Planting oats is trickery when there are plants growing in the beds. It is even more trickery when you have crows who thank you for planting the seeds for them. I ended up only planting beds where the vegetables were done for the season so I could put a lightweight row cover on them to keep the crows out. Once the oats started to push at the cover, I removed it. For some of the other beds I used winter rye, which I hope I won’t regret. 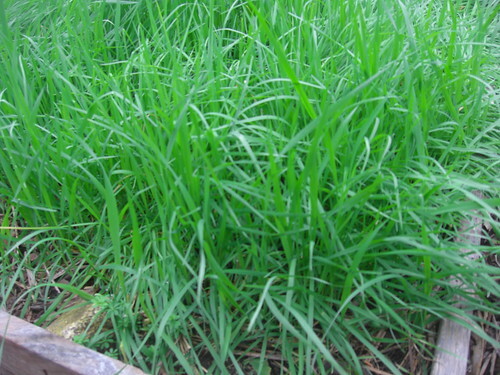 Winter rye is a perennial and cold tolerant. Lucky me, winter rye will come back this Spring so I might have devil of time to turn it under in my beds. 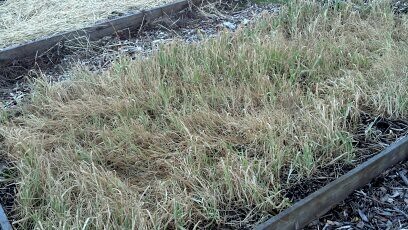 Organic Gardening states let the rye go to flower and then cut it from the bottom. Then I will have to wait for three weeks to plant seeds in those beds since rye inhibits seed germination. However, I could have avoided the rye dilemna had I been smarter about planting oats. I could have planted earlier in the summer season. Yes, you heard right. 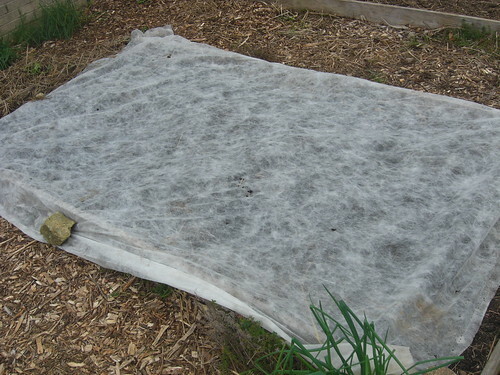 An Organic Gardening article provided a rule of thumb when to plant crop covers. If I want to plant oats, I just need to figure out how to deal with my crows without resorting to a row cover. Any suggestions about how to banish crows from eating your seeds? As for the rye, wish me luck. The bed planted with rye are intended for late summer planting such as tomatoes, pumpkins, and squash. I might leave one bed to harvest the grain. How to Plant a Backyard Crop Cover. I simply threw the seeds on my beds aiming for two seed per square inch. I probably over seeded. Then I made the mistake of putting compost and shredded leave over them thinking the crows wouldn’t find the seeds. According to Mother Earth News, I should have put about 1/2 to 1 inch of soil on top of the seeds. Personally, I think the crows would have found them regardless of what I did. As I mentioned above, I put a lightweight row cover on top of the beds and secured the ends with rocks. I am going to take Mother Earth News’ advice and sow the oats earlier. Perhaps, this spring, I might plant a bed of hulless oats to try and make my own oatmeal. As you know, I love a good challenge. Do you grow a crop cover? If so, words of advice are greatly appreciated. Do you grow rye for the grains? Do you grow oats for the grains? Which crop cover to use most and why? Note, I am an affiliate of Gardener’s Supply, who sells great row covers. Any purchase from Gardener’s Supply helps keep me knee deep in plants! I honestly don’t think a crop cover is going to help you. It sounds like you need top soil to grow grass not compost. (I tried this once. It didn’t work.) Also, you need to seed in the early spring or fall and keep the seeds moist. I cover the area with hay or straw, and water it every day to get it established. Here is another person’s opinion. See http://landscaping.about.com/o....._lawns.htm. Let me know how you make out.